As much as it pains me to call hummus a dip, for the sake of this post let’s just say it is. I’m sick of the same old boring chips and dip options. So, this Superbowl, I’m making this little crunchy suckers. 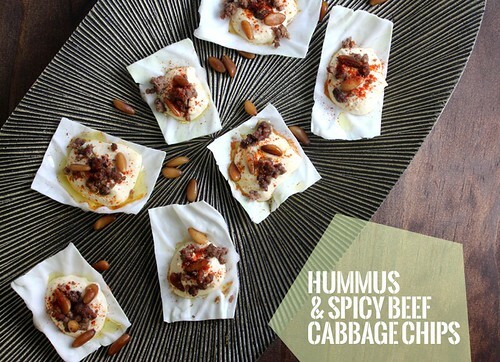 Hummus with spicy beef and toasted pine nuts on cabbage chips. They are very tasty, and it doesn’t hurt that they are very healthy either. I’ve posted on “how to make hummus” before. So, make your hummus in advance, and make sure it’s nice and creamy. It’s pretty quick to put together. Dice up some onions, throw them in a pan with some oil and sautee till soft. Then add the ground beef. Let it all cook. Add some paprika and chili powder. Make it as spicy as you like. While it’s cooking, take some cabbage leaves and cut some squares out. Spoon some hummus on top. The ground beef should be done by then, add it on top of the hummus, sprinkle some toasted pinenuts and paprika. Drizzle some olive oil, and serve!